For a fence contractor that can provide top-of-the-line fencing products and impeccable service, look no further than Chesley Fence & Deck. 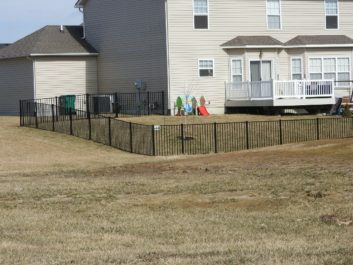 We have installed more fencing than any other company in the Glen Carbon, Illinois area, and we would be happy to install a new fence in your yard. Vinyl – American-made and manufactured by CertainTeed, our vinyl fencing is one of the most resilient fencing products on the market. It is also low maintenance and resistant to fading and discoloration over time. Aluminum – This fencing option has no visible rivets or screws and will not flake, thanks to an 11-step coating process. Our aluminum fencing pickets can also be spaced two inches apart rather than the traditional four to help keep small animals and children in the yard. Cedar – Our Western Red Cedar fencing has a natural, attractive appearance and resists warping and cracking. We also use true 2×4 rails to help increase the durability of this fencing. No matter what fencing option you choose to furnish your yard, you can rest assured that it will be installed by our own experienced and certified technicians, never subcontractors, according to industry best standards. And as a premier fencing contractor, we are so confident in the quality of our products, technicians, and installation methods that we back our products with long lasting warranties and a three-year labor warranty for added peace of mind. For more information on why we are the fence contractor of choice in the Glen Carbon, IL area, contact Chesley Fence & Deck today.